This review first appeared in the March 27, 2008 issue of the North County Times. 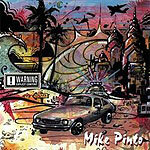 Despite a sun-drenched reggae backbeat behind every song on his new CD, San Diego's Mike Pinto doesn't really play reggae on his new CD. Or even ska. It's more of an accessible alt-rock vibe with a little hip-hop flavoring laid atop the Caribbean groove  a sort of Jimmy Buffett for a new generation. The closest he comes to a straight-ahead reggae song is on "Backburner," which is a pretty straight-ahead late '70s read on the music that Pinto sings in a West Indian patois. The most interesting song may be "Addictions," which features a heavily distorted guitar over the reggae rhythms and classic '60s pop-rock flourishes on both guitar and keyboards. But all 13 songs are pretty good. Pinto has created a mellow, pleasant mood throughout, and it makes for a fun listen.